Apparently, I’m very, very behind. Launching in April 2011, I somehow missed the existence of one the most useful and fun apps I’ve encountered in a while. Something that, like Karma, is a service I could get carried away with. 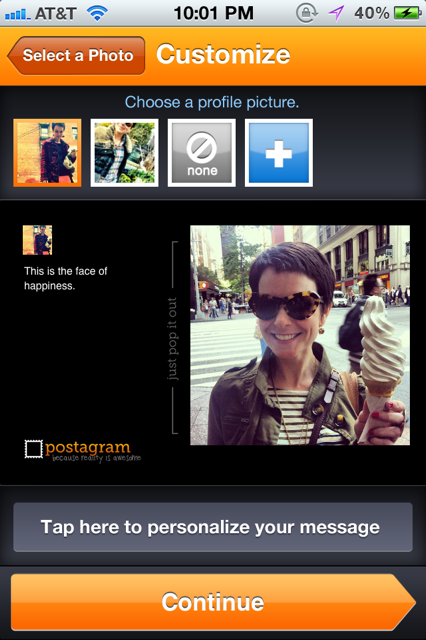 That app is Postagram. Despite loving mobile apps and written correspondence, I learned about Postagram inadvertently, arriving home this evening to a postcard that at first glance was almost mistaken for junk mail — until I saw on it my smiling face next to one of my best friends. It was a picture Liz had posted on Instagram when I was staying with her just after TechCrunch Disrupt in NYC. What? Tell me more! 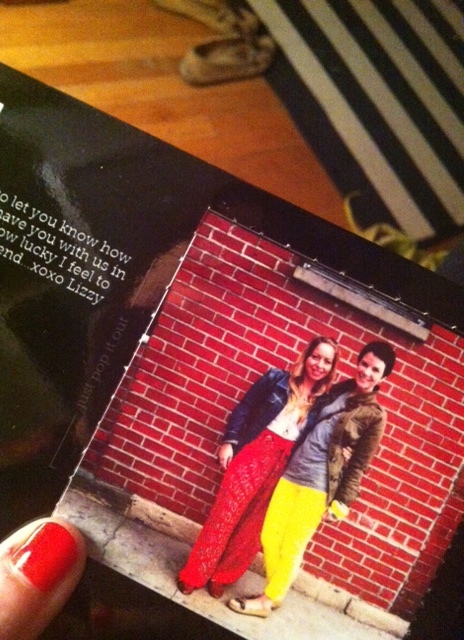 A QR code [insert audible groan here] showed me that this mailable sentiment had been sent using the Postagram app. Intrigued (and thrilled I hadn’t accidentally chucked it) I decided to investigate this exciting new (to me) service! Long story short, Postagram takes the pictures confined to your iPhone or Android photo library, Instagram account or Facebook albums and prints them on postcards that can be shipped around the globe. All for $0.99 in the US and $1.99 elsewhere. Amazing! The actual picture on the postcard comes with perforated edges so you can remove it for sentimentality and the inscription is both beside the picture and on the back of it. Pretty well thought out, if you ask me. Confession: in the first 30 minutes after I got home I sent three Postagrams. Recipients included Grandmother, Parents and Player to Be Named Later. I’m fairly convinced they’re all going to love them, because why not! Who doesn’t love mail and/or pictures of me? Right? The app is intuitive and incredibly easy to use. A user can customize almost all aspects of the process with the exception of the postcard’s background colors, but I can live with that. Begin creating your Postagram by determining which picture to immortalize. Me with gigantic Mr. Softee cone? CHECK. If you choose an Instagram photo, the app automatically imports the caption. I changed mine to be more personalized notes but it was easy to do. After that, it is like rolling a ball downhill. Enter in the recipient’s address and send it on its merry way. I have yet to pay for one because if you download Postmates now in the app store, you get five postcards free. I have two left to send and I can almost guarantee you that I’ll have them out the door tomorrow, so to speak. Have no fear, after that I’ll report back on the payment process. A few things that I’d add to my Postagram Wishlist, also known as feedback: I first noted in this post that I almost trashed the postcard because I thought it was snail mail spam. This is because the card is glossy and bright and looks like it could be an advertisement. I know Postagram is aiming for a quality photo you can pop out of the postcard and keep, but I can easily see Grandmother tossing hers by mistake. Secondly, it would be great if I could send other people’s Instagram photos to them. I’d initially gotten excited to send a Postagram to my mother of her puppy, and who has the best pictures of that puppy? My mother’s Instagram feed. If there is a way to make that happen, I’d be an even more committed user. But until then, get ready to receive more mail from me!